The Crown Cloud was created in 2013, due to an overwhelming demand for a Crown Bowl that would adapt to the increasingly popular Kaloud Lotus screen system. This has quickly become one of our most popular bowls, selling out within hours of being restocked every time we release more. It is a much larger bowl due to the diameter necessary to allow all three vents from the Lotus to be used. In mid 2015 we have built from the v2 design and made a few positive adjustments, including a slightly flared base, more dramatic curvature for easier cleaning, and larger tubing for better heat retention. 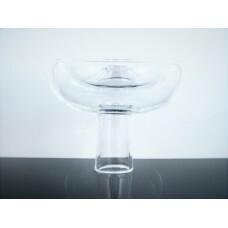 We've also employed a new process allowing the bowl to be made smaller, due to popular demand. We now offer the 25-40g range for sizing. The Crown Cloud v3.0 is the product of extensive testing and design. After using several tubing sizes, and lip techniques, we designed a bowl perfect for the Kaloud Lotus. It is ideal to make sure the bowl is completely full when using the Lotus, to prevent an air gap that would ultimately cool the bowl too much, and inhibit the smoke production. This replaced the Cloud v1 & v2 in 2015 after we found a new technique to improve hole position, and switched to a larger tubing allowing the Lotus screen system to seat better, as well as holding a varied range of tobacco to fit our customers needs. The v3, akin to the v2, seats the Lotus on the inside of the bowl, rather than the rim.